We love to see a cereal that is jam-packed with all of this good stuff! 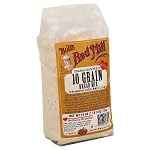 Filled with hard red wheat, rye, triticale, oat bran, oats, corn, barley, soy beans, brown rice, millet, and flaxseed. While we aren't' huge fans of triticale or soy beans, the other ingredients make for a hugely nutritious breakfast. This company has taken whole grains to a new level. They have been innovative with over 400 products including flours, cereals, baking mixes and grains.